My love language is organizing and decluttering. That’s what I figured out last weekend. The house was a total wreck, mostly because with the master bathroom refresh happening, all of the other rooms sort of spun out of control (funny how that always seems to happen during intensive room makeovering). And do you know what I did in those 7 glorious hours while they were gone? I organized. And it was LIFE GIVING! 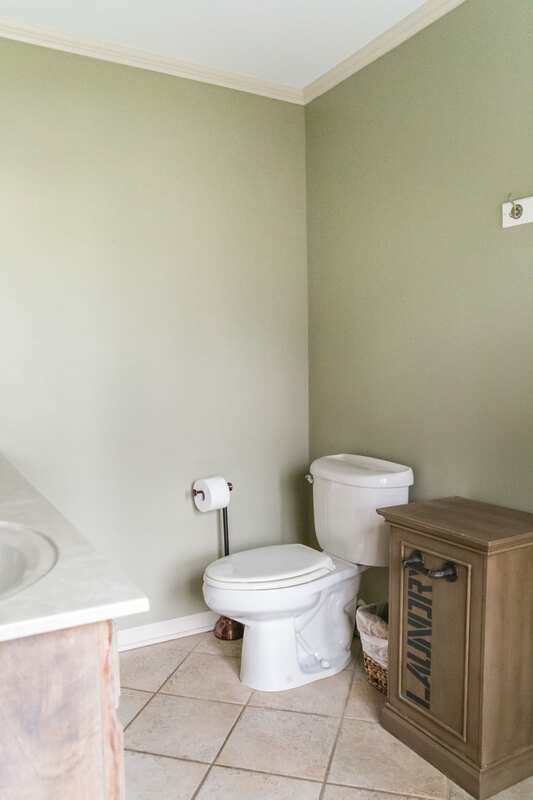 Which got me to the storage/organization situation in the master bathroom… because we have none. Zilch. That sad little hamper was barely helping. And I knew we could get so much more function out of that spot with vertical storage. 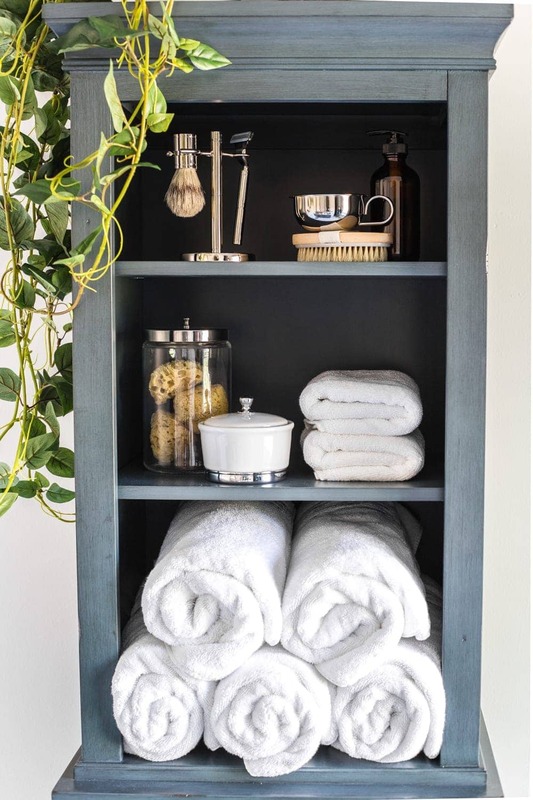 So we sprung for this Home Decorators Collection linen cabinet from The Home Depot to help with storing our towels and toiletries that usually ended up cluttering our countertop in the past. 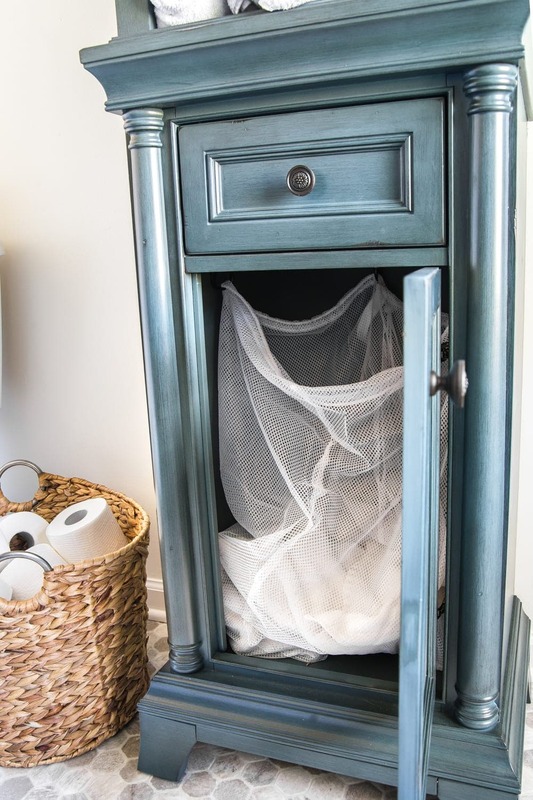 They have so much great storage furniture along with linens and pretty baskets and organizing solutions. 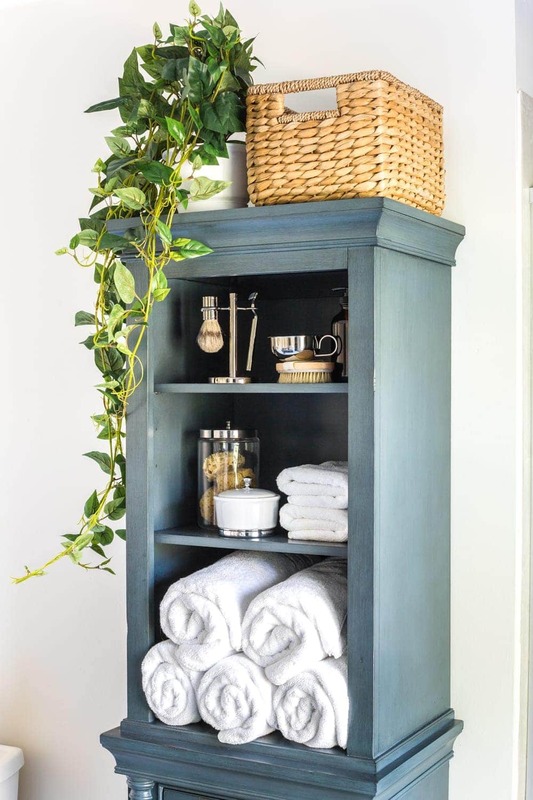 We conveniently picked up this cabinet during a big sale, so we couldn’t have even built it for the time and building materials and paint it would have taken for the sturdy quality of it. It shipped to our house for free in two days (all orders over $45 ship free), and it was already assembled. Woo to the hoo on that one! But the thing that drove me crazy was we needed a hamper too, and we had no more space for one in our tiny bathroom. 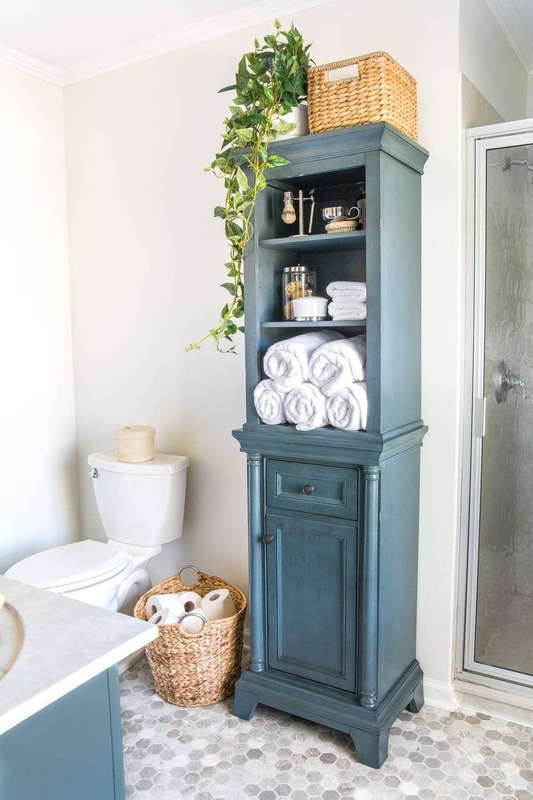 I was determined to get this linen cabinet though because I loved the color so much that it inspired the paint job on our vanity cabinet. I figured I could rig a hamper instead. And it worked! That’s it. I know, this hardly constitutes as a DIY. 1. Drill pilot holes into both sides and back of your cabinet, near the top. 2. Screw your 3 small coat hooks into the pilot holes. 3. 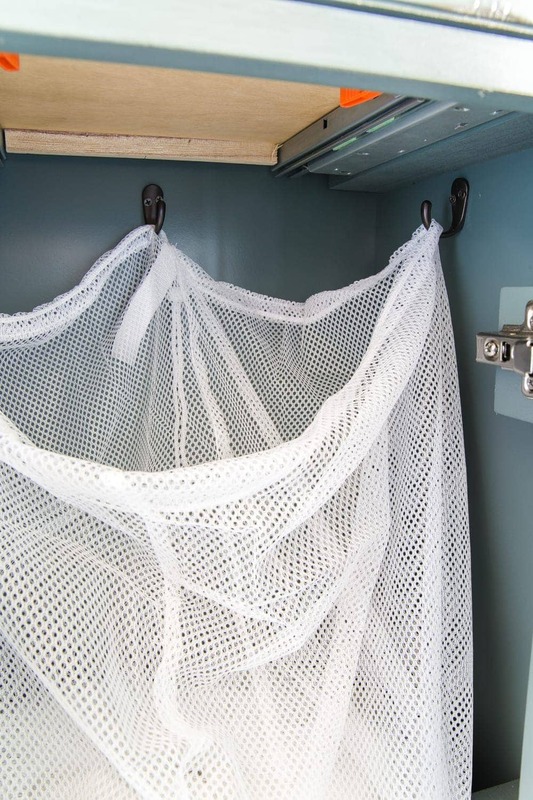 Hang your laundry bag open from the 3 hooks by poking them through the open mesh netting underneath the drawstring. Boom. You have a hamper. It’s hilarious to me how absolutely ecstatic I got over this, but hey… this mama needed functional storage to help with the daily cleaning up and she got it! 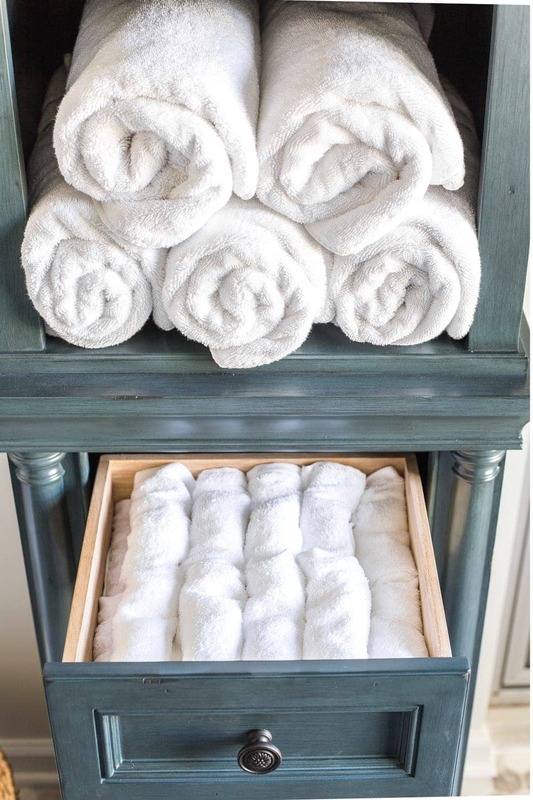 For the rest of the linen cabinet, I just rolled up our towels to store on one of the shelves, and I rolled up our washcloths to store in the drawer. I picked up a couple of canisters from The Home Depot to hold our bath sponges and cotton balls, and I stuck a basket on top for holding toiletries. And I put this philodendron plant on top to add some life to the room. Can you believe it’s artificial? It looks so real! To help with the toilet paper storage situation, I picked up this big basket too. I love how it added a bit of extra texture… even if it’s filled with very unexciting TP. I’m so thrilled to see this bathroom nearing the end and to finally get some function in here! Makes me think we should have worked on this room ages ago. 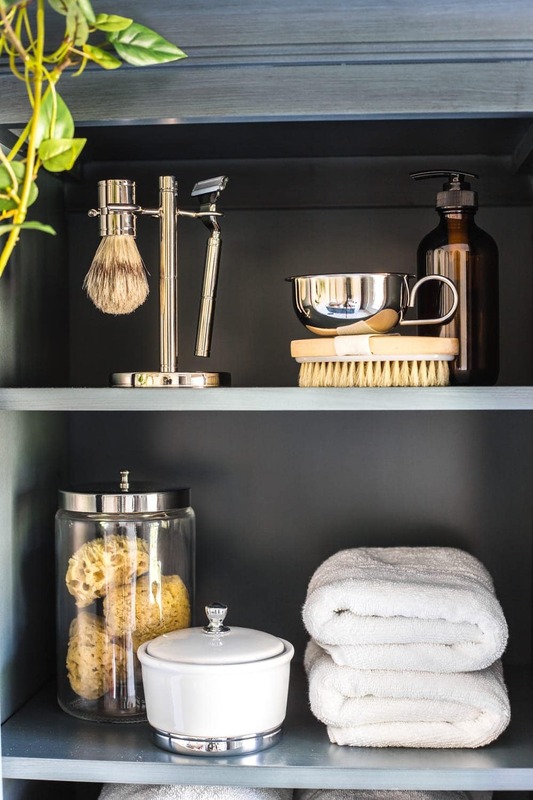 If you’re needing some pretty bathroom storage solutions, you can check out all of them at The Home Depot here. 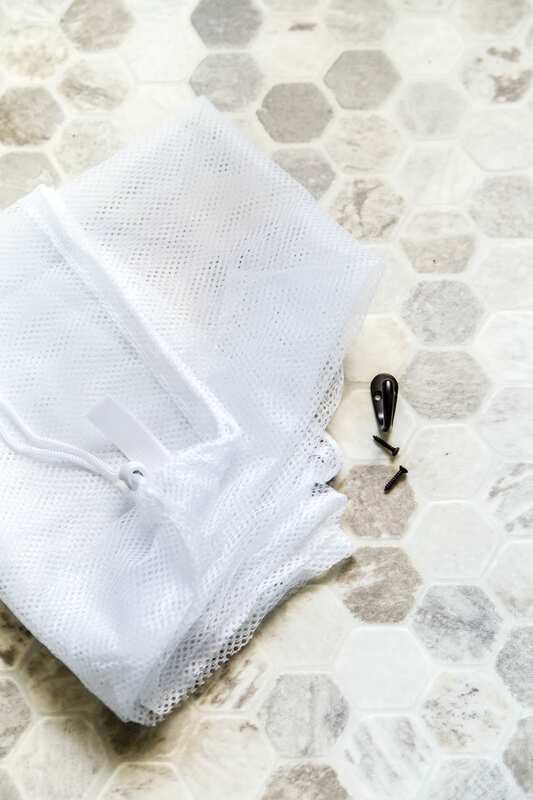 What do you think of that instant hamper trick?! Is this something everyone already figured out except me? Sometimes the best solutions are the most simple ones. Great storage solution! We also have no linen closet in our master bathroom. (How did we not notice that when we bought the house?) Now I’m waiting on you to hang that curtain in front of your shower! This is a wonderful solution to a problem most of us have in our small bathrooms. I love the blue color of the cabinet. Brilliant! Now, that was thinking on your feet. I’m not sure I would have been that creative. Great idea and one I intend to copy! Thanks for sharing a really good solution. really like how your bathroom is coming along! Nice cabinet and good idea for your laundry! Looks great! I did *swoon* a bit over your linen cabinet, but the price seems pretty steep to me! Our (only) full bath has a linen closet just outside it but not much storage space for our family of 6. I replaced an eye-level Rowell bar w/ 6 hooks, but that was the only wall w/ space for a hamper, so it went there. For extra storage (& a touch of decor) above the toilet, I added a couple $10 wood crates from Hobby Lobby, which I painted, distressed, & screwed into the wall. I think the same idea could be used over your existing hamper for a similar (& much less expensive!) effect. It’s great how your new mama brain just keeps trucking…love it all! 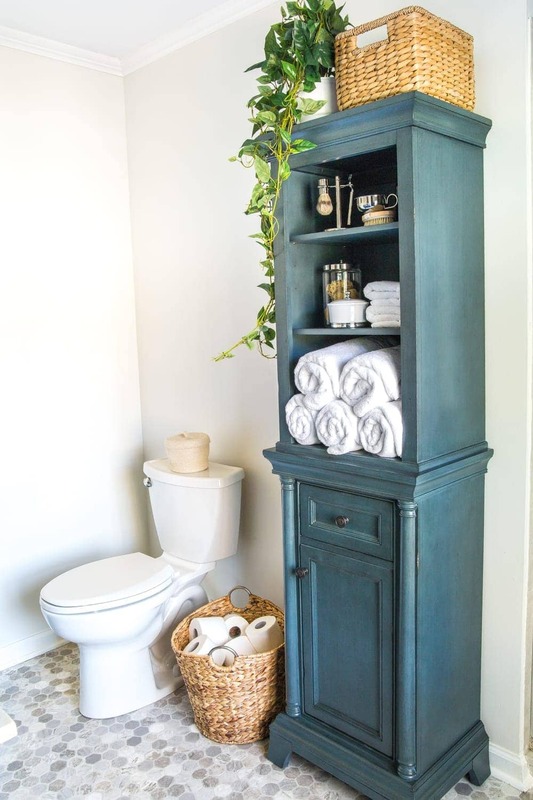 This is a wonderful idea for storage in the bathroom. Girl, you are so clever! Who knew they had decorator storage at Home Depot???!!! I sure didn’t! And that is so my color! I’ve got to start going to Home Depot more often. I live in a house with zero storage and you’re totally right, you’ve got to go Vertical to get the most out of your storage. Great post. Next time that thoughtful hubby of yours offers to take the kids, lay down and take yourself a big ole’ nap!! The organizing will still be there when you get up! ? Great idea, Lauren! Your storage cabinet is lovely! Enjoy! Thank you!! You are most welcome! !